Size: 5.7" x 4.3" x 1.0"
The €-1796 calculator combines the usual desktop basic calculator functions with a very convenient Euro currency conversion. All of the 11 yet defined exchange rates are preprogrammed in the calculator, 4 additional ones could be added later. The home country is selected with the Select-key. Two additional keys allow the conversion in both directions. A similar calculator in a smaller housing was introduced with the €-2001. A simpler calculator was sold with the €-2002+, an enhanced calculator with the €-2003. In non-EU countries the TI-1796SV was sold instead. 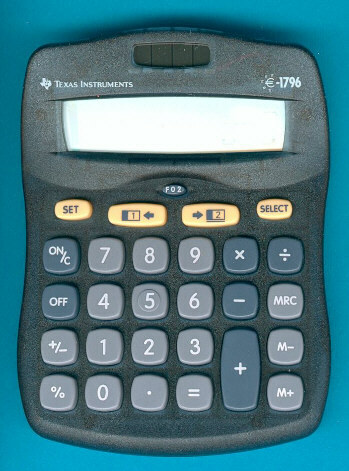 If you visited in the 2000-2003 timeframe the Texas Instruments website for educational products you should have noticed the €-1796 in a white housing like the TI-1796SV. It seems to be a fake, when we asked Texas Instruments about a statement we received the original prototype of the €-1796. • In May 1998, in accordance with the procedure laid down in the Maastricht Treaty, the countries, which were to take part in the first wave of the EMU (European Monetary Union), were announced. • On 1st January 1999, EMU will effectively start among the countries concerned, with the rates of conversion between the Euro and the participating currencies being irrevocably fixed. • On 1st January 2002, the introduction of the new bank notes and coins will signal the final conversion to the Euro as the single currency of the countries taking part in EMU. The reason for calculators like the €-line from Texas Instruments is that the Euro was formed by merging eleven national currencies at fixed exchange rates on 1.1.1999. They will persist in visible form (notes and coins) for three years until the final changeover on 1 January 2002. Therefore conversions between national currencies in the Euro are not like normal exchange rates with variable rates; they are simply a different measurement of the same underlying entity, just like pounds and kilogrammes are different scales of measurement of weight. They have fixed six-digit conversion rates (not "exchange" rates). And because of the three-year transition period, economic entities must be able to handle both kinds of money from those they deal with.